In life there are positive and negative consequences, students need to understand that with every choice there is a consequence. Poster that hangs in my room. It shows natural consequences to not doing you best in class. In my classroom I try to establish a classroom that is has a family dynamic. We cheer for one another, listen to one another, and learn together. That doesn't mean that their aren't days where the students, like all siblings, aren't at each others throat and driven to the edge by sounds, words, or just one another's presence. Every family has their good days and bad, but the key is making the students aware of their choices. From the beginning of the year onward I constantly talk about choices. By 5th grade students become more aware of choice. Their minds and body are growing to the point where they want to be seen as older as well as have more control. Giving them choice can be hard as a teacher, but sometimes a student needs to have the opportunity to crash and burn so they can learn (look I rhyme!). I try every year to set my students up for success and I will work with students if they are willing to work for themselves. Students need to know that you, the teacher, will do everything in your power to make each day amazing. That you will help them in any way you can, but they need to have the drive to work for themselves. I have told my students more times then I can count that I can give them everything, but I can't make them learn. If they try to learn, no matter how hard it might be, they will receive positive consequences in the form of support and knowledge. On the other hand if they decide to reject and give up they will have consequences that will make class and life harder. This is my Penalty Box. When a student makes a poor choice they move their name up a level. They move it back down after serving their time. Students have choices to make and especially when they get close to jr. high those choices seem to quadruple. They key is to teach students that they have choices and they need to choose wisely. Students need to coached on how to make positive choices that lead to positive consequences, sometimes they even need to be bribed. YES! I said bribed! LOL...In my class bribery comes by way of letters. Letters? Strange form of currency, but trust me it works. If my class makes positive choices when out in the hallway, in public, or with visiting adults they can earn letter to fill out words. Only compliments given by other adults can earn them a letter and those letters create words like: brownies, recess, games etc. The students can earn these positive consequences, by just being the amazing students that they are. It helps because the students have to work together to earn these compliments, but it also gives the students positive consequences to aim for. Its theirs to win or lose. Positive consequences can be earned by the whole class for compliments and making good choices. But back to my point about coaching...students need a coach. They need to have someone to push them, yet a coach needs to help them call the right plays. We have to help students make positive choices by modeling and championing those choices. It's important to practice and role play these situations in the classroom. Like how to pick a partner: How should they pick a buddy? How do you ask? What makes a good partner? What makes a bad partner? Asking questions and talking about situations allows students to know right away what you expect and allows them a chance to be championed for positive choice answers. When a student makes a good choice we have to make a big deal about it! We need everyone to understand how awesome that is. I don't care if you stop the class, get on the desk and announce that James made a great choice by giving up his spot to someone who wanted it more! DO IT!!! Play Music! Be excited and be wacky! Students want to impress you! they want to be wanted and liked so no matter how embarrassing that moment might be for them make it more embarrassing for you! If you are willing to put your self out their for one positive consequence students will be excited to make more positive consequences just to see what happens. How do you coach your students? Do you give them the freedom of choice? So something new I tried this year was an end of year countdown with my students. This was the first year in the three years that we dismissed in early May. This of course brought on excitement, pressure, and utter panic. It felt like the end of the year just snuck up on me and there was so much to do and so little time. Since my students had plenty of end of year testing to do...sad face, I wanted to do something that made learning fun again and kept them engaged for the last few weeks. I created a countdown of sorts with paper and balloons. First I created some fun activities that the students might enjoy doing, then I planned out my week of school. Like I said time got away from me but next year I hope to do 2 weeks and not just one. I then created paper cards with the different activities on them. Following that I rolled the cards and placed them in the balloons. After blowing up the balloons with the cards inside I labeled the balloons with a permanent marker. I wrote the different days of the week, but you could do letters, numbers, dates, etc. then on each day we popped one and read the card inside. This was so much fun! The students couldn't wait to pop the balloons and see what the surprise was. It was also a great classroom management activity because I told the students they had to earn each balloon. If the whole class was not on task or being positive and respectful then I wouldn't pop the balloon. Also, if I felt that a student wasn't following the rules that day they couldn't participate in the activity. I didn't have to do either and I believe this is primarily do to the excitement surrounding the balloons and the activities. Escape the Boredom Countdown is just simple, small activities that allow students to bond and be engaged the last few days of school. I really enjoyed doing these activities and seeing the growth in the students from the beginning to the end of the year. I'm currently in the process of making a TPT store and posting this as one of my free products...but since I'm not as computer savvy as I thought it might take a while. So you might be wondering what activities I put in the balloons? Well, they were all planned out based on the time I had in the day to do them and slowly built in excitement. I started with a Rock Paper Scissors Tournament where students competed the best two out of three then would cheer for the winner. The winner would then search for another winner and the cycle would continue until there was only one winner and everyone cheered for them. I also had write a letter to a future 5th grader, which became our A-Z book for a successful 5th grade year. We had sit next to your friends day, which was clearly a favorite, and game day where we had an intense escape the room game which the students loved. We also had extra recess which is one of my favorites. You could definitely do others like: movie day, minute to win it day, class outside day, hour of code day, Kahoot tournament, a theme day. There are so many options to keep your classroom busy on the last few days and the surprise will keep them engaged. What does your class do on the last few weeks of school? I'm a HUGE fan of Classroom Dojo! If you haven't set up an account please do! It is an awesome way to not only keep track of student behavior in the classroom but also bring parent involvement into the classroom. Prior to his year I heard about Classroom Dojo, but never used it. 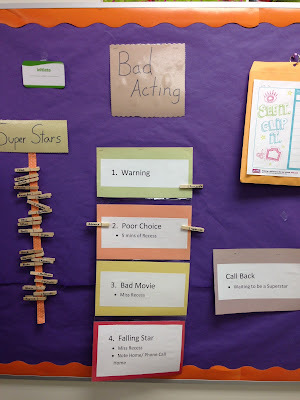 I had my classroom clip chart that seemed to be working well and I didn't think I needed anything else. 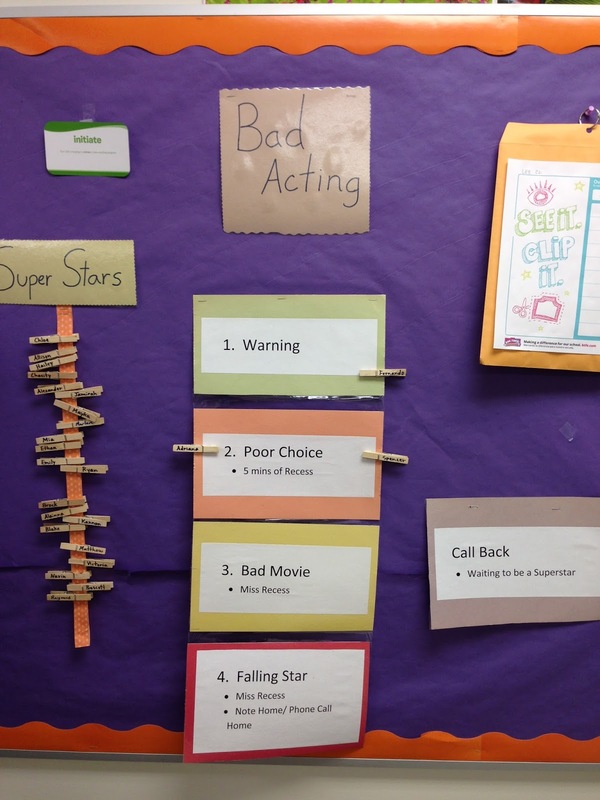 This was my old clip chart, students were suppose to keep their name on superstar all week to pick from the prize box. Every year I take on some new and different changes to my lessons in my classroom, so why not try Classroom Dojo? This past year was my first year using it and to be honest I LOVED it! It was a great program to use and there are so many ways to use it. The program is free and they give you a demo class to play with before you start which is great. I started my class and used it like my clip chart. I would take points for no homework, not following the rules, bullying etc. I also gave points when students were being helpful, participating, and following the rules. They allow you to control the points so they can range from 1-5. The goal is that students earn points throughout the day which in my classroom we spend every quarter based on a classroom dojo menu I created. With that being said there are many other ways to use the points. I have seen some teachers set class goals, benchmark point prizes, even focus more on weekly or monthly student or classroom points. It really is whatever works best for you. Student have their own monster avatar and a login that allows them and their parents to monitor their points. I tend to update points during down times throughout the day or when I need to bring attention to the classroom. For example, if the students are suppose to be working independently on something I might give points to students I see focused and working hard and take points from students who are talking. The Dojo app makes specific noises for positive and negative points, so more often than not when the students hear the negative point sound they get on task. But one of my favorite pieces is the parent connection piece. Parents can create an online account or download the free app on their electronic devices. This allows them to see their students points throughout the day. It also allows quick text like communication between the parents and the teacher, which comes in handy for setting up meetings or keeping each other in the loop about sick students. I love his so much! It has made life so much simpler throughout the year and parents have told me they check it as often as they check Facebook. Another great piece is that Dojo just recently added a classroom story page that is similar to a Facebook feed. Teachers can post pictures, videos, and announcements to show parents exactly what is going on in the classroom. This is great for 5th grade because if you ask them what they did at school they often give just a one word answer, but now they are dying for me to take photos and post them on Dojo for their parents to see. Needless to say, I am using Dojo this coming year and tweaking a few things on my part to make it work for me. I highly suggest anyone who works with children to consider using it this coming year. I guarantee you won't be disappointed. If you want help getting started or want to know about some more advanced options with Dojo please contact me. I am a Dojo Mentor at my school and I try to stay up to date with all things Dojo. This app is constantly updating and adding more possible ways to use it to fit your classroom needs. I'm in love with their Growth Mindset videos and discussions! So take a look and let me know what you think! *I am not in anyway sponsored by Dojo....I just love it and I wanted to share! A classroom tradition I started in my first year is the creation of a classroom banner. This currently is a classroom affair that involves a review of the year and a parting gift from my class to me. The first year I taught I wanted to remember my first class in a fun, creative way. I'm a sports fan so I decided to create a class banner. 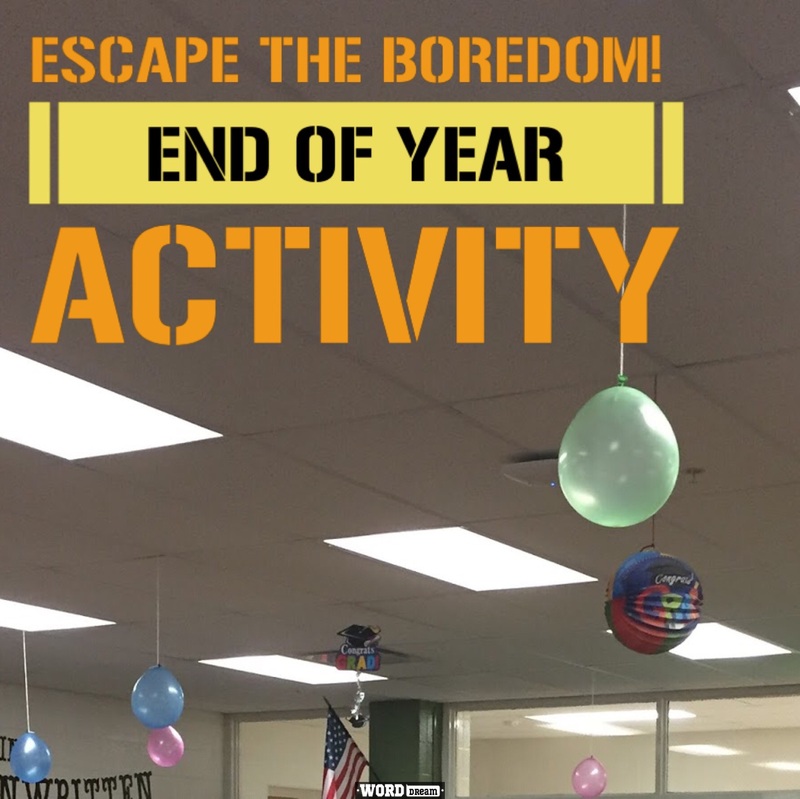 I wanted something that my students could help create to commemorate the year and hang from the ceiling like a championship banner. On the left is the 3rd Grade banner and on the right is the 5th grade banner. The first year I taught third grade so I decided to have the students create paper banners and I would use their images and ideas to create the final class banner. On the back everyone signed their name. It was a super simple and cute item that I proudly displayed on my wall the following year. The next year I taught 5th grade, once again I had them design rough drafts but they debated the items placed on the banner. They had to be things that they wouldn't forget such as memories, activities, and lessons. I wanted them to decide what the final banner looked like and be proud of it. Sadly, I forgot to get them to sign the back....sad face. I drew The final design and once again hung it up next to the first year banner. It's a simple and nice tradition that goes great with my hockey themed room. Every year is a winning year, but for different reasons. The best part is having the students reflect and decide what truly stuck with them this year. The banner we created this year (not pictured) I allowed a student to design, needless to say she did a GREAT job! 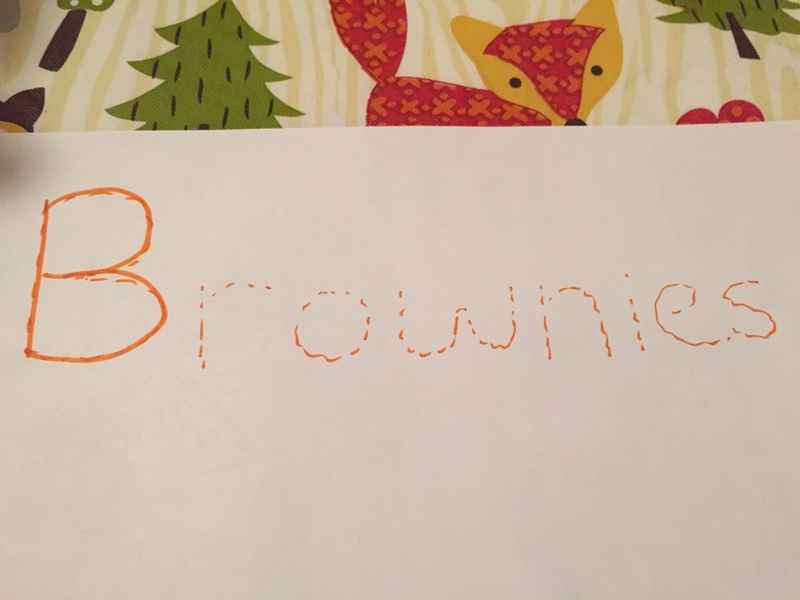 If you are looking for a simple end of the year activity for your whole class to do or maybe just a memento for you to keep then I would highly suggest this activity. Linked below you can find the banners I use, but you can also use pennants. I'm sure no matter your room theme you can find a way to incorporate it into your classroom. I love having something small to remember my students by and I like putting them up to display. The students from my past years love seeing them and my future students get excited because they like seeing all the strange, fun, crazy memories my classes have made. So as your year comes to an end think about creating something simple for the students to leave their mark on. What kinds of things have you and your students created this year? How will your class leave their mark? Comment below or tweet me your ideas! As always check me out on twitter and periscope!